Keep in mind that the following discussion is based on preliminary monthly OI.v2 Global and NINO3.4 SST anomaly data. The weekly data, though, is official. The official monthly values will be posted by NOAA on December 6, 2009, so check back in a week. NINO3.4 SST anomalies rose 0.63 deg C during November 2009 to 1.67 deg C.
But Global SST anomalies dropped 0.01 deg C. Hmmm?! The values are consistent with the weekly NINO3.4 and Global SST anomalies. NOTE: I changed the title to reflect the content of the post. That post got mentioned in two emails. The first was allegedly from Phil Jones to Tom Wigley with a CC to Ben Santer dated September 28, 2009. Actually, I do understand what was done. And, as I’ve illustrated and discussed in a number of posts, the relationship between ENSO and Global Temperature is NOT LINEAR, so the methods employed in Thompson et al (2009) cannot be used to remove the impact of ENSO from global temperature. I discussed this in great detail in my recent post “More Detail On The Multiyear Aftereffects Of ENSO - Part 2 – La Nina Events Recharge The Heat Released By El Nino Events AND...” In it I provide quotes from Trenberth et al (2002) "Evolution of El Nino–Southern Oscillation and global atmospheric surface temperatures”, to support my presentation of the relationship between ENSO and Global Temperatures. Note that the Jones link to the Thompson et al (2009) preprint no longer works. The east-west dipole in the tropical Pacific and its carryover into the Eastern Indian is well known. Refer to Figure 1, which is a .gif animation of global SST anomaly maps for the peak of the 1997/98 El Nino and the peak of the 1998/99 La Nina, the first ENSO season of the 1998/99/00/01 La Nina. Note how the SST anomalies of the East Indian and West Pacific oceans rise when the East Pacific SST anomalies drop in response to the La Nina. The methods used by Thompson et al (2009) neglect this rise in the SST anomalies for 25% of the global oceans (between 60S and 65N) during the multiyear La Nina event. The effect of the east-west dipole is also very easy to see in a comparison graph of East Pacific SST anomalies and the SST anomalies of the East Indian and West Pacific Oceans, Figure 2. Note how the opposing responses of the two datasets to the major traditional ENSO events are similar in magnitude. Yet, somehow, climate researchers attempt to remove the effects of ENSO by subtracting scaled and lagged NINO3.4 or Cold Tongue Index (CTI) data from global temperatures, even though the SST anomalies of a large portion of the global oceans reacted in the opposite direction to the change in SST anomalies of the ENSO index. The second email was allegedly from Phil Jones to Tim Osborn, Michael Mann and Gavin Schmidt the next day, September 29, 2009. I wonder what wrong assumptions he claims I’m making! One thing is sure: I’m not the one assuming the relationship between ENSO and global temperature is linear, when the instrument temperature record clearly shows it’s not. Jones could use the Hadley Centre’s HADSST2 or HADISST or the NCDC’s ERSST.v2 or ERSST.v3b to reproduce the SST anomaly graphs I’ve presented in “More Detail On The Multiyear Aftereffects Of ENSO - Part 2 – La Nina Events Recharge The Heat Released By El Nino Events AND...”. The results are the same. I’m also not the one who assumes that greenhouse gases have a noticeable effect on tropical Pacific Ocean Heat Content, when the NODC (Levitus et al – 2009) OHC data clearly shows decadal and multidecadal declines, with recharges during multiyear La Nina events. Figure 3. This was discussed in detail and illustrated in the post linked twice above and linked once again, “More Detail On The Multiyear Aftereffects Of ENSO - Part 2 – La Nina Events Recharge The Heat Released By El Nino Events AND...”. The Sources of the data used to create the illustrations in this post are listed at the end of that post. ...During Major Traditional ENSO Events, Warm Water Is Redistributed Via Ocean Currents. It will hopefully fill in some of the gaps left by my earlier discussions on the long-term effects of major traditional El Nino/La Nina events. I will not be at my computer for long stretches today, I've got visitors, so I will not be moderating comments quickly or responding to questions until tomorrow. This is Part 2 of a multipart post. It addresses critical comments about my earlier posts that dealt with the multiyear aftereffects of major traditional El Nino events. Two specific El Nino events, those in 1986/87/88 and 1997/98, caused Sea Surface Temperatures (SST) of the East Indian and West Pacific Oceans to remain at elevated levels during the subsequent La Nina events. These SST residuals, what I have called step changes in earlier posts for the sake of simplicity, bias global SST upward during the La Nina events and give the impression of a gradual increase, one that is attributed to anthropogenic greenhouse gases. 4. I’ve included illustrations and quotes from Trenberth et al (2002) "Evolution of El Nino–Southern Oscillation and global atmospheric surface temperatures” to confirm my presentation and discussions of ENSO and its impacts on SST. ...serves as one of the references in that post. I’ll use it again here. Note that the area referenced with “west Pacific tropics” is the Pacific Warm Pool. In short, the La Nina restores the heat discharged and redistributed by the El Nino. This can be illustrated with a comparison graph of NINO3.4 SST anomalies and Ocean Heat Content (OHC) of the tropical Pacific, Figure 1. The discharge and recharge can be seen if you focus on the 1972/73, 1986/87/88, and 1997/98 El Nino events. Those three major El Nino events also are not impacted to any significant extent by volcanic aerosols. The recharge is accomplished by changes in cloud amount. The “relatively clear skies” in the above quote from Trenberth et al refers to the decrease in cloud amount during the La Nina phase of ENSO. The coincidence between NINO3.4 SST anomalies and Tropical Pacific Cloud Amount can be seen in a comparison graph, Figure 2. And to quote Trenberth again, “Relatively clear skies in the central and eastern tropical Pacific allow solar radiation to enter the ocean, apparently offsetting the below normal SSTs…” So it’s an increase in Downward Shortwave Radiation (due to the decrease in cloud amount) that recharges the tropical Pacific OHC. Trenberth et al did not quantify the amount of heat restored during the La Nina phase, but if you’d like an order of magnitude for the amount of heat discharged, redistributed, and recharged during major El Nino and La Nina events, you could look at the comparison graph of NINO3.4 SST anomalies and Tropical Pacific OHC, Figure 1, and again key off the 1972/73, 1986/87/88 and 1997/98 El Nino events. The Pavlakis et al Figure 6 is shown here as Figure 3. It compares NINO3.4 SST anomalies and Downward Shortware Radiation (DSR), which is visible light, for two areas of the Central and Eastern Tropical Pacific. Note how, when NINO3.4 SST anomalies are negative, indicating a La Nina, DSR anomalies are positive, indicating that more sunlight is reaching and entering the Central and Eastern Tropical Pacific Ocean, warming it. The opposite happens during an El Nino: NINO3.4 SST anomalies are positive and DSR anomalies are negative, indicating that less visible light is warming the Central and Eastern Tropical Pacific Ocean. Keep in mind, though, that during the El Nino phase, while there may be less sunlight entering the Central and Eastern Pacific Ocean, this is happening during the discharge phase of ENSO. (-0.3 to -0.4 deg C). Cell A captures the negative cloud amount anomalies over the central tropical Pacific a year before the peak of the 1997/98 El Nino. Recall that the negative Total Cloud Amount anomalies indicate that DSR is positive. Then, during the peak months of the 1997/98 El Nino, Cell B, the Total Cloud Amount Anomalies are elevated over the central tropical Pacific, indicating that the convection and cloud cover has followed the warm water eastward during the El Nino. At this point, the central and eastern tropical Pacific are releasing large amounts of heat to the atmosphere. Note also that the Total Cloud Amount anomalies have dropped significantly over the western tropical Pacific and the eastern tropical Indian Ocean. This indicates that the Pacific Warm Pool is being recharged by DSR during the El Nino. Cell C shows the Total Cloud Amount Anomalies during the initial peak of the 1998/99/00/01 La Nina. Cloud Amount Anomalies are negative over the central and eastern Tropical Pacific, indicating the recharge of the heat released and redistributed during the El Nino. This pattern continues during the peak seasons of 1999/00 and 2000/01, Cells D and E. Cell F illustrates the Cloud Amount Anomalies of the ENSO-neutral 2001/02 season. The next logical point to address would be how much of the ocean heat recharge could be attributed to the constantly increasing infrared radiation from Anthropogenic Greenhouse Gases and how much could be attributed to the rise in visible light from the decrease in cloud amount during La Nina events. This raises the debate about the impacts of infrared radiation and visible light on Ocean Heat Content. Downward Shortwave Radiation (DSR), which is visible light, penetrates and warms the ocean for 100+ meters, while infrared radiation or Downward Longwave Radiation (DLR) only penetrates the top few centimeters. So the order of magnitude of the temporary increase in DSR (visible light) is many times greater than the long-term increase in DLR (infrared radiation) from greenhouse gases. But the argument has been presented that DLR (infrared radiation), through mixing caused by waves and wind stress turbulence, would warm the mixed layer of the ocean. This in turn would impact the temperature gradient between the mixed layer and skin, dampening the outward flow of heat from the ocean to the atmosphere. The end result according to the argument: OHC would rise due to an increase in DLR (infrared radiation) caused by increases in greenhouse gas emissions. However, refer to the Tropical Pacific OHC data, Figure 1, again. While there is no doubt that there is a positive trend in the Tropical Pacific OHC data, the graph shows decadal and multidecadal periods of decreasing OHC. During these periods, the heat released and redistributed by the El Nino events is not replaced fully by the La Nina events. If it was, OHC trends would be flat, instead of declining. What the graph does NOT show is a gradual rise in Tropical Pacific OHC as one would expect if greenhouse gases had an influence. Also note that the heat lost during these long-term decreases is replaced and additional heat is added during two multiyear periods. Those two periods coincide with the multiyear La Nina events of 1973/74/75/76 and 1998/99/00/01. In other words, these two multiyear La Nina events add more heat than is necessary to replace the heat lost over the decadal and multidecadal periods. Without those two multiyear La Nina events, the long-term trend in Tropical Pacific OHC would be negative. Describing the OHC anomalies in Figure 1 in more detail, for the decade from 1963 to 1973, OHC anomalies dropped gradually from ~0.04 GJ/m^2 to ~-0.3 GJ/m^2, and for the two decades from 1977 to 1997 (1999), OHC anomalies dropped gradually from ~0.16 GJ/m^2 to ~-0.12 GJ/m^2 (~-0.16 GJ.m^2). During the multiyear (4-year) period between them, from 1973 to 1977, OHC anomalies rose from ~-0.3 GJ/m^2 to ~0.16 GJ/m^2; this appears to be a recharge caused by the multiyear 1973/74/75/76 La Nina. The stronger trade winds reduce cloud amount, which, in turn, allows more DSR to warm the ocean. The stronger trade winds also feed that warm water to the Pacific Warm Pool at an elevated rate. With that anomalous rise in Tropical Pacific OHC in 1995/96, it could be argued that the increase in tropical Pacific OHC of ~-0.08 GJ/m^2 to ~0.24 GJ/m^2 from 1998 to late 2001 was a rebound to the values established by the 1995/96 La Nina, or it could be argued that the rise in tropical Pacific OHC was caused by the multiyear 1998/99/00/01 La Nina, similar to the 1973/74/75/76 La Nina. Regardless, the data does not support the argument that Tropical Pacific OHC rises due to an increase in DLR (infrared radiation) caused by increases in greenhouse gas emissions. It is often assumed that the effects of El Nino events on global temperatures are countered by La Nina events. That is, an El Nino is known to cause an increase in global temperature, but it is assumed that a La Nina event causes a proportional decrease in global temperature. SST anomalies for many of the ocean basins, or portions thereof, do agree with the assumption. They show comparable responses to La Nina events. Refer to Figures 6 through 8. These are comparison graphs of scaled NINO3.4 SST Anomalies and the SST anomalies of the ocean basins where El Nino and La Nina events have similar effects. However, there is a major portion of the global oceans where El Nino and La Nina events have the opposite effect on the SST anomalies. This area is well known, as is the effect. During El Nino events, Eastern Tropical Pacific SST anomalies rise, and at the same time, SST anomalies in the Western Tropical Pacific and Eastern Indian Oceans fall. During La Nina events, the opposite holds true: SST anomalies in the Eastern Tropical Pacific drop and they rise in the Western Tropical Pacific and Eastern Indian Oceans. The seesawing between the Eastern and Western Pacific SST anomalies is known as a dipole effect. This seesaw relationship can be seen in the global SST anomaly maps during El Nino and La Nina events. Refer to Figure 9, which illustrates SST anomalies near the peak of the 1997/98 El Nino and near the first seasonal peak of the 1998/99/00/01 La Nina. In fact, one phase of the opposing relationship between the SST Anomalies of the Eastern Pacific and the SST Anomalies of the Western Pacific and East Indian Oceans can be seen in the Trenberth et al sequence of lagged correlations of NINO3.4 with surface temperatures. Refer to their Figure 8, which is presented here as my Figure 10. The left-hand maps illustrate the lag correlations for the period of 1950 to 1978 and the right-hand column depicts the same for 1979 to 1998. (Trenberth et al were illustrating the differences in the evolution of El Nino events between the two periods.) I’ve highlighted the correlations at zero-month lag. The basic dipole pattern appears in both the 1950 to 1978 and 1979 to 1998 periods of the Trenberth et al Figure 8, my Figure 10. This is not an effect that is unknown. Figure 11 is a comparison of East Pacific SST anomalies and the SST Anomalies of the East Indian and West Pacific Oceans. I’ve also included scaled NINO3.4 SST anomalies as a reference for timing. The 1986/87/88 and 1997/98 El Nino events and the initial portions of the subsequent La Nina events are highlighted. It is very clear that the two datasets are out of phase. Figure 12 is the same comparison graph, but in it, I’ve highlighted a different portion of the data. The response of the East Pacific SST anomalies to the major El Nino events of 1986/87/88 and 1887/98 is very visible in that comparison graph. But note how little the SST anomalies of the East Indian and West Pacific drop (the area highlighted) while the SST anomalies in the East Pacific are rising dramatically. This happens because traditional El Nino events are fueled by subsurface waters from the Western Tropical Pacific, from depths to 300 meters in the Pacific Warm Pool. These subsurface waters are not included in SST measurements. Figure 13 is the comparison graph of East Pacific SST anomalies and the SST Anomalies of the East Indian and West Pacific Oceans once again, but in this instance, I’ve highlighted the periods during which the SST anomalies of the East Indian and West Pacific Oceans diverge greatly from the variations in the East Pacific SST anomalies (which are correlated with NINO3.4 SST anomalies). Much of the East-West dipole effect between the East Pacific and the East Indian-West Pacific is caused by the movement of warm water within the Pacific Basin. During the formation of El Nino events, a Kelvin Wave carries warm water east. Note the eastward progression of Sea Surface Height anomalies along the equatorial Pacific illustrated in Figure 14. And during the La Nina, warm water is carried west by a Rossby wave that forms in the eastern Tropical Pacific north of the equator. This is illustrated in Figure 15 with the progression of Sea Surface Height anomalies from east to west. The transport of warm water from west to east during the 1997/98 El Nino formation and from east to west during the 1998/99 portion of the subsequent La Nina can also be seen quite plainly in the Sea Level Residual animation from JPL, starting at about 50 seconds into the video. (The video in mpeg format is linked above.) Let the video continue after the Kelvin and Rossby waves associated with the 1997/98 El Nino and watch how long the Sea Level Residuals in the East Indian and West Pacific Oceans remain elevated after that ENSO event. Wind-driven ocean currents also change during El Nino and La Nina phases. During the 1997/98 El Nino, the Equatorial Countercurrent in the Pacific increases in flow, Figure 16. This carries warm water from the western Tropical Pacific to the east. And during the La Nina, the flow of the Equatorial Countercurrent in the Pacific has decreased; the North and South Equatorial Currents dominate then and carry warm water back to the western Tropical Pacific. Note also in Figure 17, that there is a current that flows from east to west through the Indonesian Archipelago, north of Australia, from the Tropical Pacific to the Tropical Indian Ocean. That current is called the Indonesian Throughflow. After the warm water has been returned west after the El Nino event, the Indonesian Throughflow carries it into the Tropical Indian Ocean. Note that there are a great number of coupled ocean-atmosphere processes taking place within the Pacific Ocean before, during, and after ENSO events. The above explanation using ocean currents is very simple. Those in search of more detailed discussions could start with the references in Trenberth et al (2002). As discussed in the preceding, the warm water that fuels a traditional El Nino is stored in the Pacific Warm Pool. This warm water was “supplied” by the prior La Nina event. During an El Nino, that warm water travels east and is spread across the surface of the Eastern Tropical Pacific. Then during the La Nina that follows, the warm water is transported to the Western Tropical Pacific, where it is carried poleward and to the Eastern Indian Ocean by ocean currents. At the same time, during the La Nina, cloud cover over the Tropical Pacific decreases and Downward Shortwave Radiation (DSR) increases, warming the ocean surface more. Ocean currents carry this water to the Western Tropical Pacific, where it recharges the Pacific Warm Pool. At the end of the complete cycle of El Nino (discharge) and La Nina (redistribution and recharge), the Ocean Heat Content of the Tropical Pacific is restored (Figure 1) and sea surface temperatures have been raised. In other words, Tropical Pacific Ocean Heat Content is regulated by the discharge, redistribution, and recharge of heat during El Nino and La Nina events. The heat that is released and the warm water that is redistributed during the traditional El Nino are “replaced” by the increase in Downward Shortwave Radiation during the La Nina. It appears that the redistribution of warm water during the La Nina and its impact on atmospheric circulation are overlooked when climate researchers attempt to account for the effects of ENSO on global temperatures, since they do not consider the dipole effect that takes place within the Pacific when they attempt to remove the effects of ENSO from global temperatures. Climate researchers assume the relationship between ENSO and global temperature is linear, when it clearly is not. Figures 11 through 13 presented comparison graphs of East Pacific SST Anomalies and the SST Anomalies of the East Indian and West Pacific Oceans. For Figure 18, I’ve combined those two datasets and plotted them, listing them as East Indian and Pacific SST Anomalies. Assume for example that an ENSO event in total includes the combined effects of the El Nino and the subsequent La Nina, because the warm water released during the traditional El Nino continues to be redistributed during the La Nina. I’ve highlighted the points in Figure 18 at which the SST anomalies “equalize” before and after the major traditional El Nino events of 1986/87/88 and 1997/98 and their resulting La Nina events. I’ve also noted the approximate SST anomalies at those times. Over the multiyear period between the two ENSO events, SST anomalies for the combined East Indian and Pacific data (red) have remained relatively flat. They rose only ~0.02 deg C, from ~0.1 to 0.12 deg C, between mid-1990 and late 1996. And during the multiyear period after the 1997/98 and 1998/99/00/01 La Nina, SST anomalies have declined. But during the multiyear period of the 1986/87/88 El Nino and the 1988/89 La Nina, the East Indian and Pacific SST anomalies rose ~0.17 deg C, from ~-0.07 to ~0.1 deg C. And during the period of the 1997/98 El Nino and 1998/99/00/01 La Nina, the SST anomalies for the combined East Indian and Pacific dataset increased ~0.1 deg C, from ~0.12 to ~0.22 deg C. SST anomalies for the periods between and after major traditional ENSO (El Nino and La Nina) events either remain flat or they decline. But they rise during those major traditional ENSO (El Nino and La Nina) events. This is not a simple coincidence; causation is known. I presented a number of reasons why the ENSO residuals (the apparent step changes) in the SST anomalies of the East Indian and West Pacific SST anomalies were important at the conclusion of my post “Global Temperatures This Decade Will Be The Warmest On Record…”. I’ll reproduce one here. Note that I’ve changed the Figure numbers for this post. The step changes bias the global SST anomalies upward and give the impression of a gradual increase in SST anomalies. This can be seen in a comparison graph of the SST anomalies of the East Indian and West Pacific Oceans, the SST anomalies of the “Rest of the World” (East Pacific, Atlantic, and West Indian Oceans), and the combination of the two, Figure 19. The period since 1996 is unique in the last 40+ years. There haven’t been any major volcanic eruptions to add noise to the data. This is why the data in Figure 19 starts in 1996. Note how in Figure 19 the East Indian and West Pacific SST anomalies linger at the elevated levels while the SST anomalies for the “Rest of the World” are mimicking the variability of the NINO3.4 SST anomalies, shown in part in Figures 6 through 8. (That is, the SST anomalies for the “Rest of the World” are responding as researchers expect to both El Nino and La Nina events.) Over the next few years, ocean currents “mix” the elevated SST anomalies of the East Indian and West Pacific Oceans with the depressed SST anomalies of the “Rest of the World” oceans, dropping one and raising the other, until they intersect in 2003. This is more than 4 years after the end of the 1997/98 El Nino. Because the Global SST anomalies are a combination of the two, they are biased upward by the elevated East Indian-West Pacific SST anomalies and by the mixing with the waters of the “Rest of the World”. This gives the false impression of a gradual increase in global SST anomalies. Note that Trenberth et al (2002) serves as a wonderful resource when studying the effects of ENSO on global climate. However, the paper was written in 2000, published in 2002, and the data used in it stops in 1998. As illustrated above, the long-term effects of major traditional El Nino/La Nina events are best illustrated over the period of 1997 through 2001, because there were no volcanic eruptions to add noise to the data. Obviously, Trenberth et al could not have captured or discussed the long-term effects of that El Nino/La Nina event. The papers that use this erroneous method are listed toward the bottom of my post Global Temperatures This Decade Will Be The Warmest On Record…, under the heading of “Papers That Portray A Linear Relationship Between ENSO And Global Temperatures”. And as illustrated in this post, the ENSO residuals from the 1986/87/88 El Nino and 1988/89 La Nina and from the 1997/98 El Nino and 1998/99/00/01 La Nina, account for most of the rise in global SST anomalies from 1981 to 2009, excluding the North Atlantic, of course, which is dominated by the Atlantic Multidecadal Oscillation). In addition to the sources noted throughout the text, the others are listed below. I’ve moved to WordPress. This post can now be found at What’s Wrong With This Graph? The following graph of global temperature anomalies is from the “The Copenhagen Diagnosis, 2009: Updating the world on the Latest Climate Science.” The report was released today with obvious intent. I scrolled as far as Figure 3, then copied it, and closed “The Copenhagen Diagnosis”. I’d had enough. Please feel free to answer the question asked in the title of this post. UPDATE (November 25, 2009): In the comments, Alessandro noticed what I did. He wrote, “The smoothing is not declared and probably the final part ('2000) is corrected.” But I will make my case that those smoothed curves are trends of some sort. …(The authors of the "Copenhagen Diagnosis use the IPCC AR4 as a reference) you’d note that the IPCC’s smoothing methods do show plateauing of temperatures toward the end of the data, in 2005. Refer to Figures 3.1, Figure 3.4 Cell A, Figure 3.6, and FAQ3.1 Figure 1. “IPCC AR4 presented ‘an unambiguous picture of the ongoing warming of the climate system.’ The atmospheric warming trend continues to climb despite 2008 being cooler than 2007 (Figure 3). For example, the IPCC gave the 25-year trend as 0.177 +/- 0.052 deg C per decade for the period ending 2006 (based on the HadCRUT data). Updating this by including the last two years (2007 and 2008), the trend becomes 0.187 +/- 0.052 deg C per decade for the period ending 2008. The recent observed climate trend is thus one of ongoing warming, in line with IPCC predictions. So if these are, in fact, trend lines, the authors of the “Copenhagen Diagnosis” have created a double-edged sword for themselves. Trend lines can be projected forward in time for use in forecasts. That is one of the intents of trend lines. (The trend line options for EXCEL provide the option for extending the trends.) So eyeballing the trend forecasts onto Figure 3, we see a continuous warming over the next decade or two, as the authors intended. BUT (BIG BUT) those same trend lines can also be used for projections into the past, for hindcasts. Are they now reinstating the Medieval Warm Period? Actually, the IPCC lists that trend for the period ending in 2005, not 2006. Refer again to FAQ3.1 Figure 1 in AR4 Chapter 3. In the description, they write, “Linear trend fits to the last 25 (yellow), 50 (orange), 100 (purple) and 150 years (red) are shown, and correspond to 1981 to 2005, 1956 to 2005, 1906 to 2005, and 1856 to 2005, respectively.” The specific trend values are listed in the artwork. Global SST anomalies are still elevated, but they have not changed appreciably over the past few weeks. They are approximately 0.05 deg C lower than the peak earlier this year. This is part 1 of a multipart post. It addresses critical comments about my earlier posts that dealt with the multiyear aftereffects of significant traditional El Nino events. Two specific El Nino events, those in 1986/87/88 and the 1997/98, caused Sea Surface Temperatures of the East Indian and West Pacific Oceans to remain at elevated levels during the subsequent La Nina events. These SST residuals, what I have called step changes in earlier posts for the sake of simplicity, bias the global SST during the La Nina events and give the impression of a gradual increase, one that is attributed to anthropogenic greenhouse gases. This first post in the series is for those who wanted confirmation in scientific papers that El Nino events warm the oceans remote to the Pacific through processes other than heat transfer. In this post, I’ll use two papers as reference. Wang (2005) describes how sea surface temperatures can and do rise in response to El Nino events in areas of the global oceans remote to the tropical Pacific. It concentrates on the Tropical North Atlantic and the Western Hemisphere Warm Pool. Basically, the rise in sea surface temperature of the North Atlantic is a response to changes in atmospheric circulation. Wang (2005) is provided here for those familiar with Hadley and Walker Circulation, wind stress and the like. Again, Wang (2005) explains how El Nino events can and do raise SST in an area remote to the tropical Pacific. The response of the North Atlantic to ENSO can also be seen in a comparison graph of NINO3.4 SST anomalies and North Atlantic SST anomalies, Figure 1. The second paper is Trenberth et al (2002) "Evolution of El Nino–Southern Oscillation and global atmospheric surface temperatures." In it, Trenberth et al provide broader discussions of how ENSO events can and do impact global LST and SST. The paper deals with the period of 1950 to 1998, which obviously will not include the multiyear aftereffects of the 1997/98 El Nino that is evident in the data, but it does reinforce Wang (2005). It is an excellent reference for those interested in ENSO dynamics and global responses to ENSO. In other words, there are El Nino-induced processes other than heat transfer that cause warming outside of the tropical Pacific. Throughout the rest of the paper they discuss the processes that cause the Atlantic, Pacific, and Indian Oceans to respond to El Nino events. These descriptions and discussions make up the body of the paper, so it’s not practical to reproduce all of it here. There are many more discussions of the diabatic and adiabatic processes throughout the paper. But El Nino events do cause SST anomalies outside of the tropical Pacific to rise. These can be seen in comparison graphs of NINO3.4 SST anomalies and the SST anomalies of the ocean basins, Figures 4 through 7. The North Atlantic comparison is shown above In Figure 1. Through changes in atmospheric circulation and through the redistribution of warm water by ocean currents, El Nino events cause SST anomalies to rise. The next post is the discussion of ENSO discharge/recharge. Trenberth et al provide an overview of this on page 16, paragraph 57, for those who want to read ahead. That post will also reinforce the processes that cause the SST anomalies of the East Indian and West Pacific to linger through the La Nina events and cause the bias that is mistaken for anthropogenic warming of the oceans. Will The 2009/10 El Nino Become A “Super” El Nino? I’ve moved to WordPress. This post can now be found at Will The 2009/10 El Nino Become A “Super” El Nino? HOW DO THE CURRENT SUBSURFACE ANOMALIES COMPARE TO PAST EL NINO EVENTS? 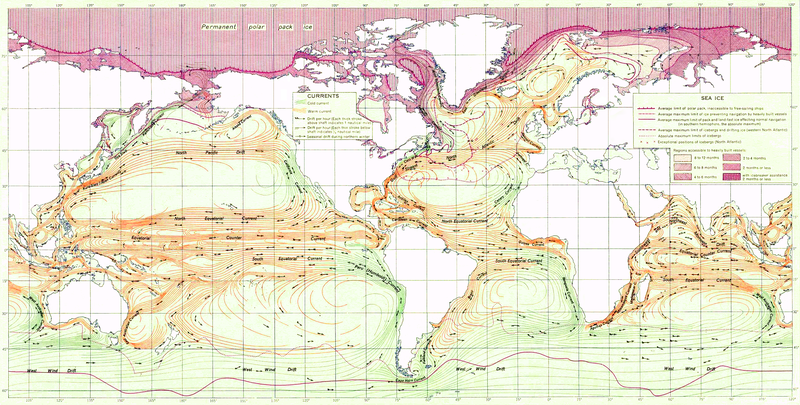 The graphics also include the Indian and Atlantic Ocean cross-sections. The archive starts in January 1959, and the most current month is October 2009. Unfortunately, it’s the recent elevated subsurface anomalies that concern some, and they rise significantly over the past few weeks, so the October monthly graphic really does not capture that recent surge. But ECMWF also presents daily “real time” views that start in February 2007. So for this visual comparison of current conditions to past major El Nino events I’ll use the recent daily view and the historic monthly views. I’ve provided a graph of NINO3.4 SST anomalies since 1970 as a reference, Figure 2. To put the recent subsurface anomalies into perspective, here are .gif animations of the daily view for November 13, 2009 compared to the November graphics of major El Nino events since 1970. Again, keep in mind that these .gif animations compare monthly values for November to a daily value near to the middle of November 2009. Also, this is only a visual comparison, nothing more. You'll also note that the monthly graphics of the earlier El Nino events appear to be more mature. That is, their warm anomalies reach as far east as the continental land mass, but the current warm anomalies are still a significant distance away. Is the current El Nino late to develop or is that difference in apparent development a function of the daily versus monthly views? Dunno. The comparison of the current graphic to November 1997 (near the peak of the El Nino of the Century) is shown in Figure 3. The current anomalies are nowhere close to it. The SST anomalies of the 1982/83 El Nino peaked near to the NINO3.4 SST anomalies of the 1997/98 El Nino. The current subsurface anomalies appear lower than the November 1982 values, Figure 4. Third on the list of major El Nino events was the 1972/73 El Nino, and the current subsurface anomalies appear to fall short of its November 1972 values, as shown in Figure 5. The peak SST anomalies of the 1991/92 El Nino are next, and the current anomalies appear higher. Refer to Figure 6. Next for your viewing pleasure is November 1986 (part way into the 1986/87/88 El Nino). The current values also appear a little stronger than it, too, Figure 7. So if these comparisons of subsurface anomalies can be used as a predictor of the peak SST anomalies, the current El Nino would peak somewhere between the 1991/92 El Nino and the 1972/73 El Nino. Will it? Dunno. I don’t make predictions. The current El Nino may have some surprises in store.